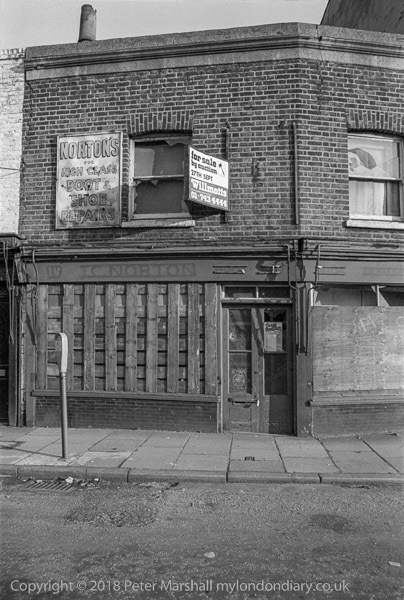 J C Norton's for High Class Boot & Shoe Repairs was at 119-121 Tyers Place, close to the Vauxhall City Farm. I don't know how much the shop raised at auction, but rather to my surprise the building is still there, though difficult to recognise following extensive rebuilding and extension. The building has different first floor windows, and an extra storey, and the ground floor frontage has changed, with the door in the different place. The house is at a slight bend in the street and retains the horizontal bands at the top of the wall above the first floor, with the second floor being set back behind this parapet.